Just four months after being in a coma, Mike Short was crawling through tunnels, jumping over fiery logs, and scaling walls as part of a 5K race known as a "rugged maniac." The Georgia native owes his ability to participate in the race to the neurocritical care team at Mayo Clinic that helped him recover from a brain injury he suffered shortly after his 50th birthday. Diagnosed with a seizure disorder in childhood, Mike had had only a handful of grand mal seizures in his life. But on April 9, 2016, while visiting a friend in Blackshear, Georgia, he had another. It was his first in 10 years. The seizure caused Mike to fall and hit his head. He was transported to a local hospital where he had another seizure. “I aspirated everything into my lungs and passed out due to lack of oxygen,” Mike recalls being told. Mike was suffering from hypoxia, a below-normal level of oxygen in the blood. Brain hypoxia — also known as a hypoxic-ischemic brain injury — occurs when the brain doesn’t get enough oxygen, typically when someone is drowning, choking, suffocating or in cardiac arrest. Recognizing Mike needed more specialized care, the local facility arranged for him to be flown to Mayo Clinic’s Florida campus, which has a specialized ICU for neurological disorders. The care he received there not only led to a remarkable recovery, it helped Mike reframe his future. When Mike arrived at Mayo Clinic, a team of experts led by NeuroICU director W. David Freeman, M.D., put Mike into a medically induced coma. They were afraid he could suffer another grand mal seizure, which could have led to permanent brain damage. Doctors performed a bronchoscopy to clear Mike’s lungs and restore his blood oxygen to a healthy level. An MRI followed to see how much brain damage the hypoxia had caused. In a situation like Mike’s, a patient’s outlook is determined by how many minutes have passed without oxygen adequately flowing to the brain. The faster oxygen can be returned to the brain, the better the outcome. Based on a clinical exam and the available data, Dr. Freeman says he was optimistic for Mike. Mike remained in a coma for the next 12 days. It was a challenging time. Mike finally woke from his coma on April 20. Although he has no memory of that time, Mike says his family shared nothing but positive thoughts about Dr. Freeman and senior neurocritical care fellow, Michael Pizzi, D.O., Ph.D.
“Drs. Pizzi and Freeman were especially good at helping my two sisters understand everything that was happening and helping them cope,” Mike says. Predictions aside, no one really knew how Mike would fare after waking up. But with assistance from speech and physical therapists and encouragement from Dr. Pizzi, Mike improved quickly. Mike was discharged from Mayo Clinic to an inpatient rehabilitation facility near his home in Atlanta on May 3, 2016. Two weeks later, he graduated to outpatient therapy. “Mr. Short falls into the minority of patients with this particular brain injury to make such a dramatic recovery,” Dr. Pizzi says. Mike had always wanted to do a "rugged maniac" race. 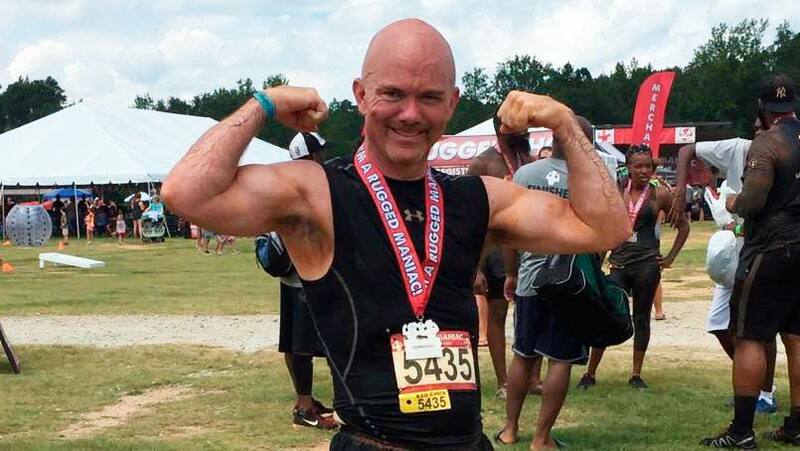 After getting clearance from his local neurologist, Mike registered for a nearby race. When the race day came in August, he was filled with a sense of accomplishment. After that, Mike realized there was something else he really wanted to achieve. Ten years earlier, Mike had begun the process to obtain a master’s degree in counseling. But ultimately he had opted not to pursue it. He says his experience at Mayo Clinic and rehab put him in the environments where he realized he wanted to work. Today, Mike is moving forward to pursue licensed clinical social work. “There are so many things under that umbrella that I am interested in, and I want to be in a clinical setting,” he says. He wrote about his brain injury in his application to the graduate social work program at Kennesaw State University, in Kennesaw, Georgia, sharing his hopes to work in a medical or rehab facility. Learn more about Neurocritical Care and Neurocritical Care education at Mayo Clinic. Read about grand mal seizures and hypoxia. Love this story! Am very grateful for my outcome too! Head injury not sure what caused it but having lived through this has helped me forcus my energy on simple things in life that I can admit I've taken for granted. As a former RN Student I've put that on hold back 12 years and haven't been drivin by anything to center myself on. I always wanted to be a Nurse, when my Grandpa passed away from cancer back in 1996 Inwas devastated. BUT focused my education onto being an Oncologist Registered Nurse. I left nursing College after the my 1st 2years at my Alma Mater ALVERNO COLLEGE here in Wisconsin. Now that this has happened we've been working towards my recovery first also the idea of returning to college and complete my degree in Nursing is my new goal.